Home can mean many things to different people. Sure, it’s the place where you sleep a night. But home is much more than just a house. It’s also the neighborhood you live in and the people who live in the houses around you – people who often become life long friends. There’s a saying among Realtors these days that goes like this: The last generation looked forward to the day they could pay off their mortgage, but this generation looks forward to the day they can get one. There is a lot of truth in this. And that is why it is key for Sellers to understand just how important that home loan is to Buyers. Reading through this Carter and Associates annual Decatur market report, you’ll notice we repeatedly mention how the most successful homes sales in the area are homes that are “move-in ready”. This is because today’s homes shoppers are buying the absolute most house that they can afford. They are treating their home as an investment, not just a place to live. 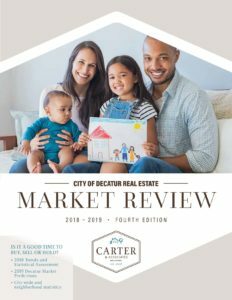 We’re proud to release the City of Decatur Real Estate Market Review for 2018. It’s our annual report on the City of Decatur, where we’ve culled all of our insights on its neighborhoods — information gleaned from working as a Decatur real estate team, talking with hundreds of people throughout the year, and from putting our heads on pillows in this city every night. We share neighborhood-specific historic sales numbers, prices, price per square foot, and 2019 predictions for each. Recommendations for taking your home to market — what repairs should you undertake, how should you market the house, and how to debut the listing. A broader look at the Atlanta market as a whole, including employment rate, interest, home inventory, and housing trends. What’s going on with the few homes that didn’t sell. We could go on, but why not just take a look at the report? You can download it here — 2018-2019 City of Decatur Market Review, or pick up a hardcopy at Kavarna Coffee, Oakhurst Market, The Marlay House, Ale Yeah, SqFt Decatur, Universal Joint, and Pure Gas Station Decatur. Spend a few minutes with it, and you’ll see it’s the kind of detailed, insider information that comes from years of specific experience in Decatur. If you’re considering selling your home, we are a team that understands this city better than anyone — and are passionate about Decatur. And while you’re at it, subscribe to our newsletter (on the right), and you’ll be sure not to miss next year’s edition of this valuable report. Be informed! Get "news you can use" delivered right in your inbox.